Apart from a bespoke plugin and Ofnuts gave advice on that. My thoughts on the subject. 100 PDF's to open. Gimp can open as layers but that involves 100 clicks on the import button. Take into consideration that Gimp will render the PDF(s) to bitmaps. What was a scalable vector (including text) becomes a fixed ppi bitmap. 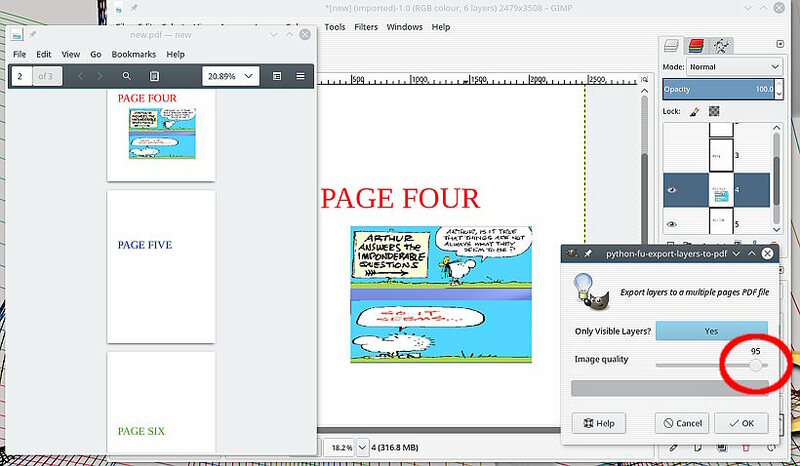 If the PDF's are multi-page, Gimp will number the layers per document ie. 1,2,3, 1#1,2#1,3#1,4 which can result in a scrambled final combined PDF. There are scripts/plug-ins that will rename layers with consecutive numbers. A better way is combine the pdfs beforehand with a utility such as PDFsam (pdf split-and-merge) there is a free version. 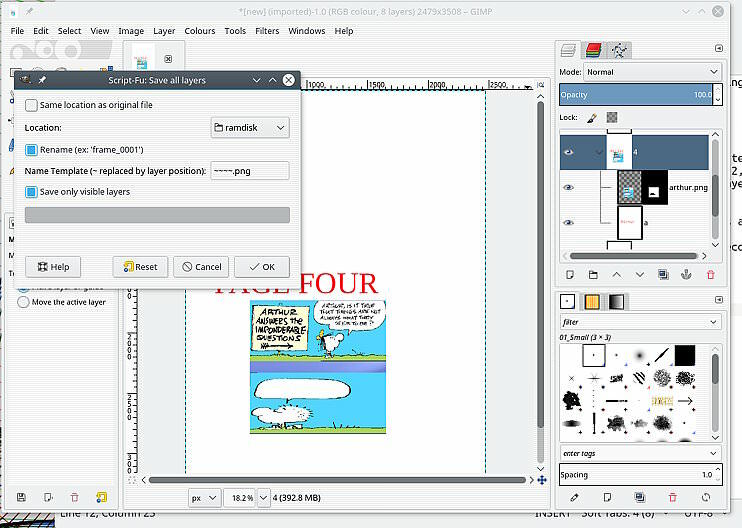 Combining will give a single PDF to open in Gimp. If many of pages are pure text, splitting allows picking just the graphic pages from the PDF(s) to be edited/recombined. Depending on the number of pure text pages this can make a big difference in the final PDF size. edit: Also have a look at pdftk. It is command line but more suitable for a linux bash file. Install ImageMagick (IM), it is probably already there, if not it will be in your disto repository. The above but straight from Gimp. There is a (old, bit flakey) plug-in export-layers-to-pdf.py (attached) that uses IM (see note about pdf format) to export the layers to a temp folder, combines those to a new PDF. Caveats, will fail with layer groups and layer mask so up-to-you to flatten first. screenshot with result open in PDF viewer: https://i.imgur.com/CqG5eMg.jpg Choose a quality setting less than 100 and the bitmaps are jpeg, makes a big difference to the PDF size. Long and complicated: Yes, but at least it is not dumbed-down click-n-wish.